A recent trip to Santa Barbara, California, presented me with an opportunity to do some sights and calculations. In the following example I took a series of Sun sights not long before the Local Apparent Noon (LAN). 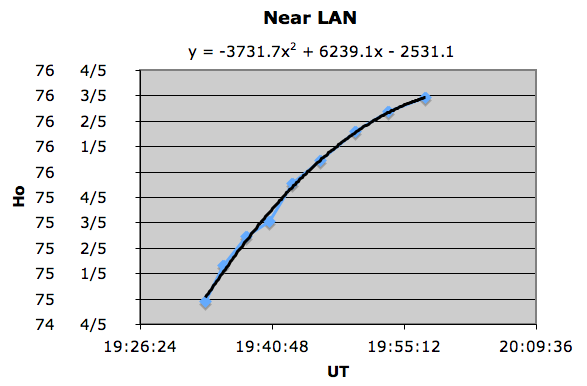 I was unable to stay long enough to observe the actual meridian upper transit of the Sun but the data were still suitable for a noon-curve construction by extrapolation and thus establishing the latitude and longitude of my location with decent enough accuracy. 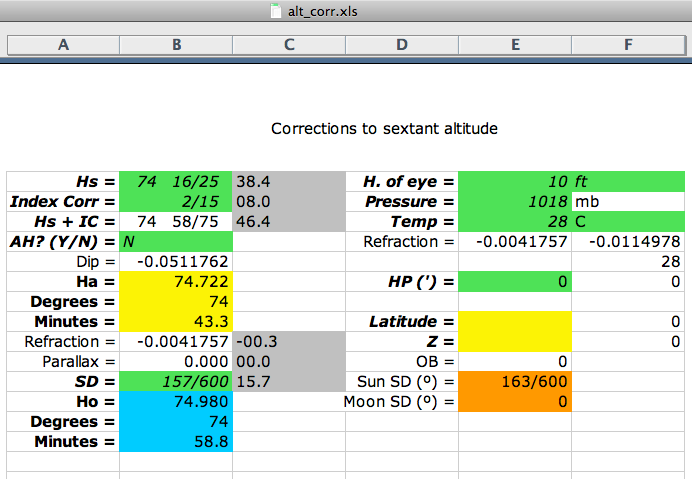 Observed altitudes (Ho) were obtained from the recorded sextant altitudes (Hs) with alt_corr.xls; see the first data point as an example (these were lower-limb observations, hence the SD correction is positive). 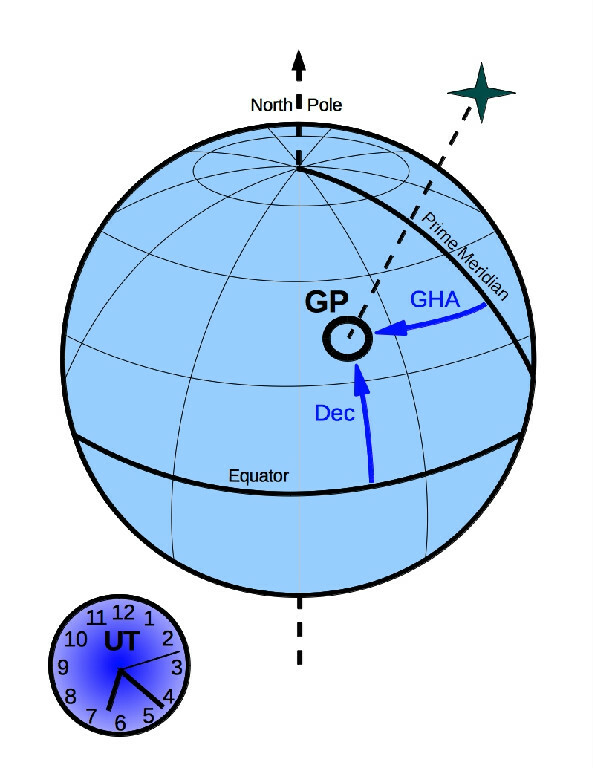 The Sun GHA, Declination, SD, and (later) Equation-of-Time values came from sun.xls. The intercept and azimuth were calculated with intercept.xls. The intercept distances are small as expected, since they were calculated using the known position as the AP. The fact that the intercepts are not exactly zero is a measure of the quality of the instrument and the skill of the person using it. The azimuths approach the meridian passage value of 180º but stop just short of it due to reasons explained above. In the following image we can indeed see a rather convincing arc that would peak shortly after 20h UT. This plot has the Ho’s on the y-axis. Before the actual fitting these Ho’s are further adjusted to account for the Sun’s hourly declination change of -0.4′. In addition, the noon_motion.xls spreadsheet is also capable of addressing the construction of this curve on a moving vessel; in this case the speed is zero since I made the observations from a fixed location. One generally expects getting a very accurate latitude value and not-so-great longitude value from meridian-transit observations. In the past I have observed that the parabolic fitting employed by these spreadsheets works very well if the data actually straddle the culmination point. This computed result is not as good but it is still reasonable, especially since it came from a data set that stopped short of LAN and hence had to be extrapolated.